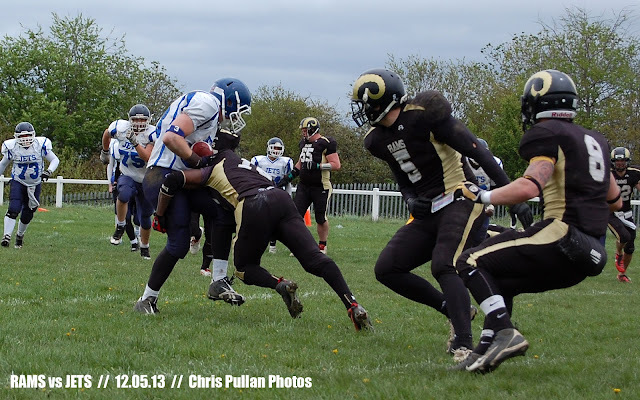 The Yorkshire Rams (1-2) secured their first win of the season with a hard fought 7 – 6 victory against a resolute and determined Coventry Jets (1-2) team. The score line was representative of an epic defensive performance on behalf of both teams. The Rams offence sparked at times but suffered through inconsistency in the face of a talented and competitive Jets defence. The Rams defence, in contrast, put on an outstanding team display led by some great individual performances including Adam Cowley who wreaked havoc in the Jets backfield all afternoon. And Randy Pryce who scored the Rams only touchdown. The first half was a see-saw battle of defences with neither offence able to gain any real momentum. The Rams usually effective running game often bought breaks of promise but was ultimately unable to breach the Jets stout defensive line. The Rams defence controlled the Jets offence throughout the entire half, consistently stopping the run and forcing the Jets into third and long on a regular basis. At that point the Rams pass rush took over. The Jets QB was under constant pressure and was sacked on numerous occasions. The half ended with the scores tied 0 – 0 and was a fair reflection of the stellar defensive display. The second half continued in the same vein until the Rams defence scored the rams only touchdown on a turnover collected by Randy Pryce and taken into the endzone. 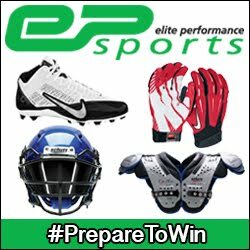 On the Jets following drive they put together their first successful series and drove the ball into the Rams endzone , leaving them only the extra point to bring the scores level. Coventry tried for 2 points but once more the Rams unit attacked and the conversion failed. After the Jets score the the defences took over again. As the clock wound down the Jets tried furiously to get into scoring position and were repeatedly knocked back a Rams defence that on this day would not be beaten. With under 2 mins left in the game, Coventry found themselves inside the Rams 5, first and goal. With each ensuing play the Rams pushed the Jets back until they were 4th and goal from outside the Rams 20 and were forced to attempt a potential game winning field goal, which was unsuccessful. The Yorkshire Rams will be looking to carry forward this momentum this Sunday when they travel to Sheffield to face the 2012 division 2 Champions, the Sheffield Predators (1-0), in another Yorkshire clash.